The pictures below are of Running Stallion Breyer models that are too new to be considered vintage, however they are retired in that they are no longer being produced. 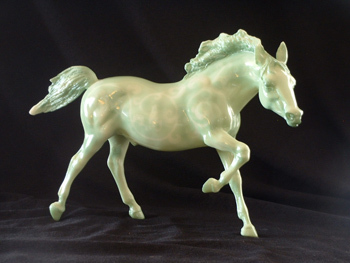 This first picture is of the QVC Jade "Year of the Horse" Breyer Running Stallion Horse model was only produced in 2002 as a Series Run for QVC. 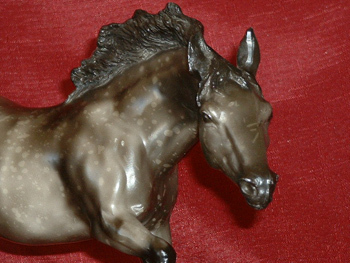 This very dark dapple gray Breyer Running Stallion model is named Rumbling Thumber and was produced from 1993 to 1994. His finish is semigloss.